There is abundant evidence for the presence of endogenous cannabinoid signaling systems in many nonmammalian species, including several classes of invertebrates. Interest in the study of these animals largely relates to their production of distinct and measurable specialized behaviors. 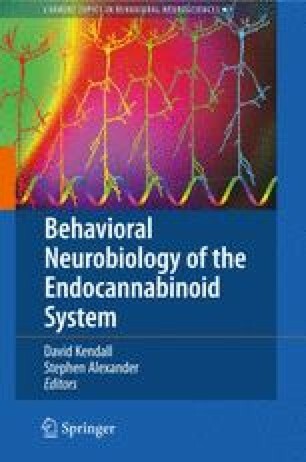 The ability to alter these behaviors through manipulation of cannabinoid signaling has provided important insight into both the phylogenetic history and physiological relevance of this essential neuromodulatory system. This chapter presents a review of literature relevant to cannabinoid-altered behaviors in nonmammalian species from insects through advanced vocal learning avian species. Integration of findings supports a common role for endocannabinoid (ECB) modulation of ingestive and locomotor behaviors, with interesting contrasting agonist effects that distinguish vertebrate and invertebrate classes. Studies in amphibians and birds suggest that ECB signaling may function as a behavioral switch, allowing redirection from less- to more-essential behaviors in response to emergent environmental changes. Overall, the studies provide evidence for cannabinoid modulation of aggression, emesis, feeding behavior, locomotor activity, reproductive behaviors, vocal learning, sensory perception and stress responses.